Greatest Excuse For Being A Crappy Dancer. Panoramic of the view from aid station 5 - Canyon Vista (22.2 miles). As I begin writing this report I have just wrapped up running back to back 25 mile training runs which will be my last long training weekend before Eastern States 100 which is now less than three weeks away. 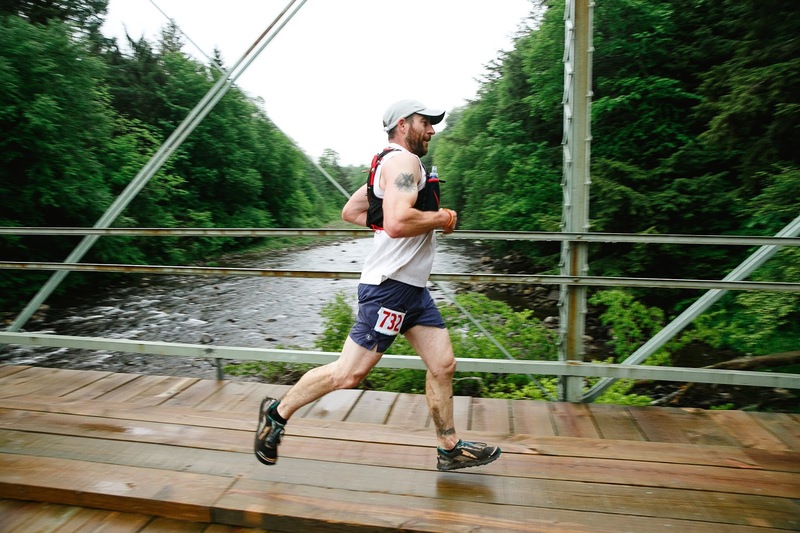 During these back to back long runs I had plenty of time to relive and analyze my day at the Worlds End 100k. It wasn’t a perfect day, but it was by no means a bad day either. I had some low points and there was plenty of room for improvement, but I managed and dealt with the tougher times to experience some high points throughout the day as well. The high points were positives for me, but the greatest and most valuable positive for me from my day at Worlds End was what I’ve learned from struggling through the low points that tested me. 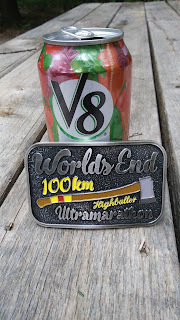 You see, Worlds End was only the second race I’ve done of over 50 miles so although I’m somewhat inexperienced in ultrarunning in general, I’m extremely inexperienced in running the longer distance ultras. Thankfully or not (I’m not sure if I should be grateful for this), the main cause of the majority of my challenges throughout the day were self imposed and largely due to just poor planning on my part. Hopefully, I will apply what I’ve learned from my mistakes when it comes time to run Eastern States 100 as repeating them there may lead to greater consequences and ultimately a DNF as problems that begin within a 100k distance could very well intensify and worsen if they happen during a hundred miler. Not to mention that even on a good day Eastern States is not an “easy” hundred miler as it has an overall finish rate of around 30 percent in it’s three years of existence. 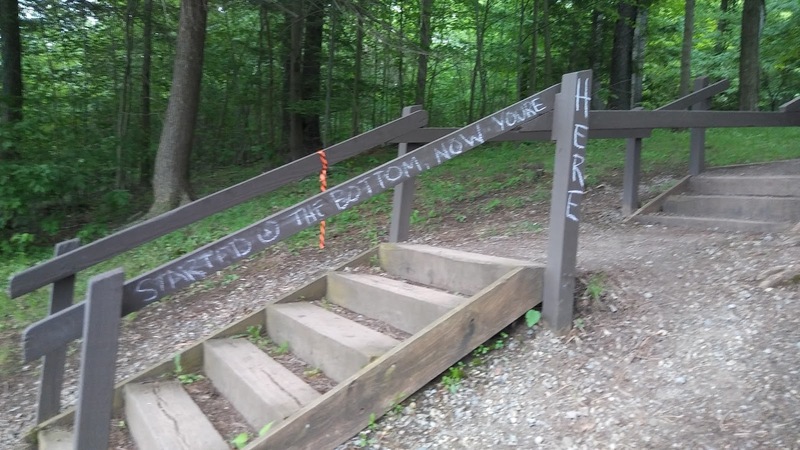 A welcoming sign at the start/finish area. Worlds End Ultramarathon offers 50k and 100k distances. 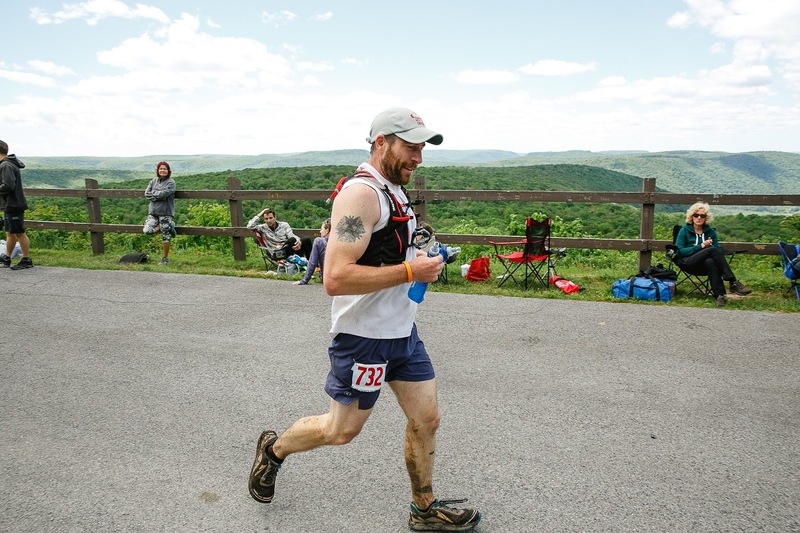 I chose to run the 100k as that is the second race of the PA Triple Crown Series and successfully completing the series is my ultrarunning goal for 2017. I feel that the best way to describe Worlds End is simple and only requires one word: relentless. This is how another runner described the course to me early in the day and as the day went on and I covered a greater and greater distance, the closer to perfection that word became. Just look at the elevation profile and I think you’ll agree that “relentless” is a great descriptor. The technicality of the course hits you early and never lets up. They call it Rocksylvania for a reason. Stream crossings? Check. Maybe not all years, but at least this year many sections that at first glance looked completely and easily runnable were anything but due to the ground being so wet that my feet sank into the shoe sucking muck. For all of these challenges I was accepting; my greatest challenges during the race were not due to external factors such as weather or trail conditions. My greatest hurdles during Worlds End were of my own doing, primarily due to poor planning or a total lack of planning. I’m going to start with what I believe may be an often overlooked challenge due to the fact that it is for the most part not apparent to anyone but the runner himself or herself. It may be displayed in their body language, but if so it may be masked well or at least not obvious to anyone else. It is a lack of confidence or an overly anxious feeling going into a race. It is a fear that you didn’t train enough or train well enough. It results in thoughts of insecurity and mental orchestrations of countless scenarios of a day ending in a grand failure. In brief, it is a poor mental state to face a challenge. And I believe that’s where I was leading up to Worlds End, which is quite a challenging event. A view of Loyalsock Creek near the start/finish area. ﻿﻿Thankfully, I believe I know how I ended up there and I was able to work through it with minimal impacts affecting my race. I believe the cause of my excessive anxiety was due to my divergent outlooks going into my previous two races (NJ Ultra Trail Festival and Hyner View Trail Challenge 50k) and my overall mental state during those two races. Going into NJ Ultra Fest I was very confident. With hindsight I would say I was overconfident. Then, to put it plainly, I had what felt like a crap run. That’s the short version. If you want all the details you can check out the full race report. Following what I felt like was a crap run I went into the Hyner much less confident. I had low expectations and set goals for myself that I thought I probably would not reach. I then ended up having a nearly perfect day and exceeding all of my goals. So high expectations and solid confidence led to missed goals while low self confidence and planning on failure led to over achieving. This was my mindset going into Worlds End. Do I fake self confidence and envision success as I always hear people say you should do or do what actually worked last time: lower expectations and expect failure? I struggled going back and forth leading up to Worlds End and never came to a decision. I only made myself overly anxious, stressed, and uncertain. This is not how you want to feel starting your second longest intended run ever. 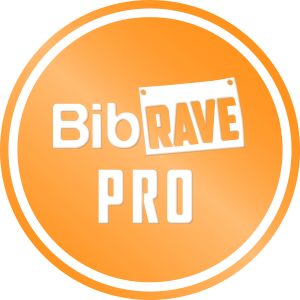 I was shaky pinning my bib to my shorts and continued to shake at the starting line. It was dark at the start and I hadn’t done much night running so that added to the uneasy feelings. It was raining lightly making all of the exposed rock on the technical trail extra slick. The guy right in front of me was moving at a pace that I didn’t feel a need to pass, but his feet were sliding around so much and he nearly crashed so many times right in front of me that I was nervous for him. All of this added to the anxiety which I struggled through for the first 10 to 15 miles of the run. 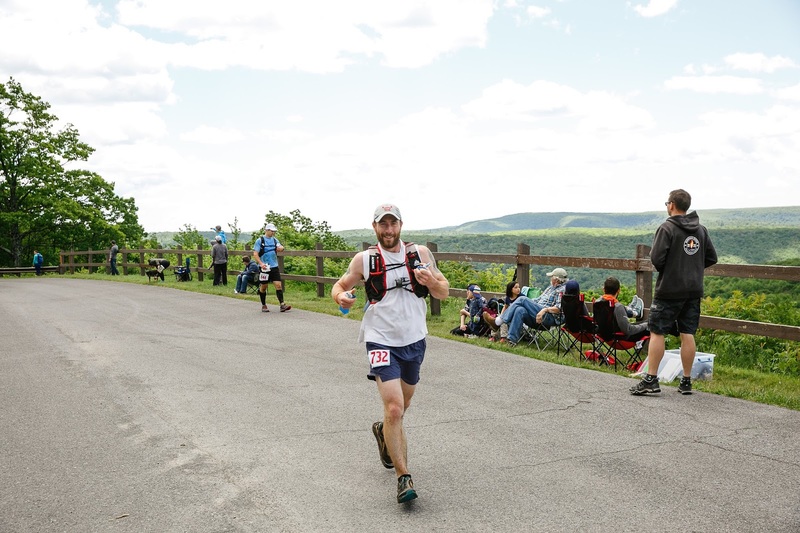 I would say it wasn’t until aid station four (19.3 miles) that the anxious feelings had completely subsided and I finally felt like I had settled into a good pace and bearable mindset for the day. 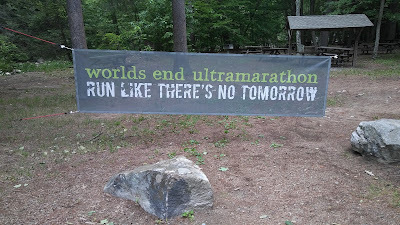 A little extra motivation from the Canyon Vista aid station. After leaving aid station 4 and over the next 20 miles or so were the golden miles of the day for me. My head had finally calmed and I continued to feel good with a decent portion of the distance behind me. I began to push a bit harder on the climbs and hammer the not as technical downhills and my quads continued to respond and hold up to the abuse. I covered the majority of this middle section of the course with a couple other runners at what I would call a slightly faster than conversational pace. We could chat with one another, but it wasn’t always comfortable due to the pace. During this stretch we had several stream crossings and ran through many mucky sections of trail. It was the kind of muck where if you step in the wrong spot your shoe will sink ankle deep and your foot will feel wet and grainy after removal. Earlier this would have worried me, but not now. 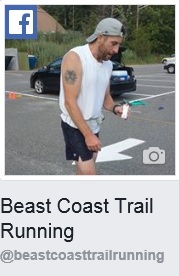 I had just run my last two 50ks with soaked feet and little to no foot problems to show afterwards. We had intermittent conversations between the three of us as we covered some decent miles while we played leapfrog for several hours. For the most part, the three of us followed this pattern until aid station 8 (41.6 miles). Not long after this, my day began to go downhill, but only figuratively as there were still plenty of literal climbs remaining on the course. Not exactly on the course, but right behind the Canyon Vista aid station. I stopped in to check it out the day after the race and it was definitely worth the time. The cause of the downward spiral that would begin was no one’s fault but my own. Yes, I could point some fingers to disperse some of the blame, but if I had simply done a bit more preparation before race day and had a better plan in place the bonk and mental low points I was about to experience likely would have been completely avoided. The underlying cause of the problem was poor planning and an altogether lack of planning. This led to me going through a bit of a bonk which, to make matters worse, coincided with two water only aid stations. To begin with, the main cause of the bonk was my overall nutrition plan. 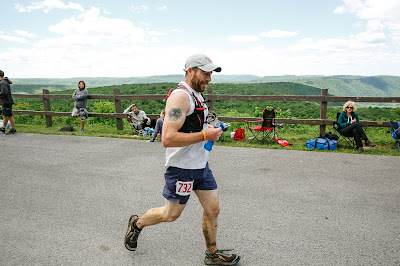 I had decided against my better judgement that I would simply do the same thing I had done at the Hyner 50k that had worked so well for me: drink lots of tailwind, eat a gel at the aid station, and eat a gel between aid stations. I had finished Hyner feeling like I still had some gas in the tank doing this, so I decided I would just do the same thing for twice as long at Worlds End. In all honesty I never truly believed I would maintain this nutrition plan for a 100k, but sold it to myself by convincing myself there was a slim chance it would work and if it did I would have an amazing day just like at the Hyner. It didn’t and I bonked hard several times from around mile 41 to mile 58. Arriving at High Knob aid station (mile 35.8). A poor and unrealistic nutrition plan was mistake one. Mistake two was not doing my homework. I mentioned a bit earlier that my bonk coincided with two water only aid stations. This is where doing a bit of planning in advance such as knowing how far apart between aid stations and which ones are water only would have been extremely useful. In my attempt to combat my pre race anxiety and be relaxed and carefree about this race I had done almost no planning. I had no drop bags, crew, or pacers. I hadn’t even examined the aid station guide close enough to realize that there were any water only aid stations. All I knew for certain was that this was going to be the hardest course I had ever run and the second longest distance I had ever attempted. I’m not trying to make excuses here, just stating facts. 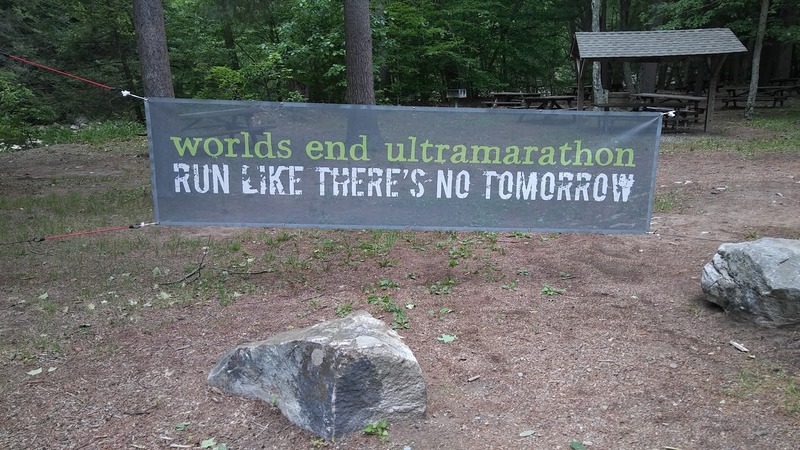 All of the race information was published and on the Worlds End Ultra website for anyone to see. I just didn’t look. 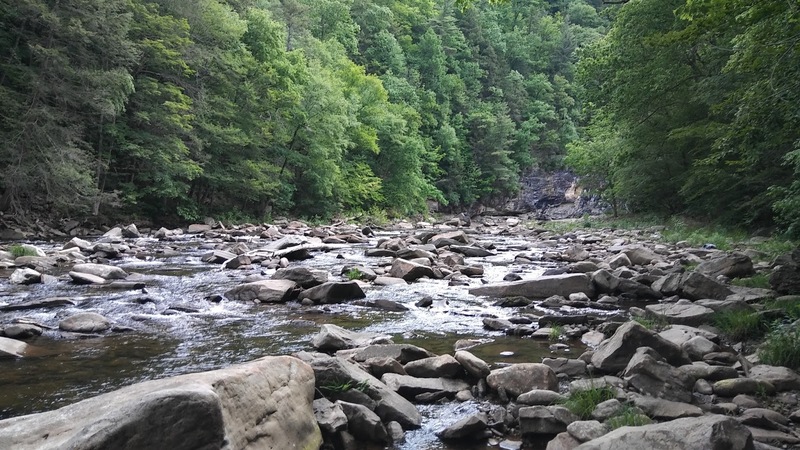 And so as it happened as I was bonking and as I realized I was bonking I passed through a water only aid station, aid station 9 (45.4 miles), not knowing how far until the next aid station where I could get some calories in me. At this point I was over 10 hours in consuming primarily only Tailwind and gels. My stomach was rumbling for some real food and the rest of my body needed it too. It turned out to be another 4.6 miles to aid station 10 (50 miles) where I quickly ate anything that looked good. That was mostly a few bites of grilled cheese, pickles, and pretzels. I left feeling better than when I had arrived knowing that I had some real food in my stomach. I felt like I may have over packed for just two nights of camping and running, but I was going straight to a wedding after. That positive feeling started to fade a few miles out as my feet finally started to complain. The super technical terrain combined with hours of saturation had taken a toll on my feet and they were beginning to rebel. I had felt several hot spots during the day and more recently I had felt several blisters tear open and gush. It was somewhere in this stretch that I hit my lowest point of the day. I had a grumbling stomach, blistered feet, and a bonky head. I wondered why I had ever decided to attempt the PA Triple Crown Series. I told myself that I probably wouldn’t be able to finish Eastern States based on how today was going. I wondered if I should even make the drive all the way to the middle of nowhere PA to start Eastern States. I kinda had a bit of a pity party for myself. As I rolled up to aid station 11 to find out it was water only, it was just one more item to add to my list of reasons to celebrate the pity. It felt like it took a long time, but I finally made it to aid station 12 (57.9 miles), the final aid station. I decide that I would take my time here and get the calories my body needed and the solid food that my stomach craved. I think I ate nearly two grilled cheeses and drank a 12 ounce can worth of Coca-Cola. I left the aid station in much better spirits and with a satisfied stomach. I was moving better immediately leaving the aid station and quickly caught up with a couple guys that had passed me shortly before reaching the aid station. I ran with them for a bit, but quickly found myself wanting to push the pace a bit more. This was some of the most runnable terrain we had seen all day and the elevation change was extremely gradual compared to the other 95% of the course. I don’t know if it was the Coke, the grilled cheese, or just the excitement of knowing I was only a few miles from the finish line, but I was ready to run again. The pain had subsided and I was feeling more energized and motivated than I had at almost anytime earlier in the day. Shortly after I had started to put a bit of distance between me and the couple guys I had just been running with I heard another runner exchange greetings with them. He was moving fast and it gave me an adrenaline rush and a goal to try to keep pace with him. It felt like we were doing sub 8 minute miles, but my Garmin data tells me that at best we did just over a 10 minute mile. Although cruising at a 10 minute mile pace certainly does feel fast when you’d been struggling to do sub 20 minute miles not that long ago. I kept with my newest companion until about the last half mile of the course where there is a gnarly and steep descent. I nearly wiped out on a slick piece of stone and decided to cut it back so I wouldn’t hurt myself with less than a mile to go. Coming into High Knob aid station (mile 35.8). With that final “sprint” at the finish I ended the day on a high. It was like the low points had never existed. I wouldn’t remember them again until later that night as I hobbled into the camp showers and attempted to wash my busted up and raw feet. That was later though, and at the finish I felt good. There was a camping party feel at the finish area with most of the 25k distance runners already recovering and hanging out. There was no shortage of food with pulled pork, burgers, mac and cheese, and a plethora of hot soups to choose from. The pulled pork sounded so good, but after a few bites I realized my stomach wasn’t ready for a full meal. However, at about 3 AM the following morning when I woke up in my sleeping bag with a mad appetite that pulled pork sandwich was devoured in about two minutes flat then I rolled over and went back to sleep. It all could have been a dream, but I found the empty plate next to me in the morning to confirm that it had actually happened. So what is the take away and what did I learn from this race? For one thing, avoiding planning or making plans does not solve anxiety. Maybe planning would have helped relieve some anxiety. Secondly, this was the hardest race I had ever attempted and although that scared me and made a good part of the race painful and unenjoyable, I was proud of myself for doing it and happy that I put myself through the process. The day after the race my wife and I attended a wedding where we drank a bit more than usual and danced, at least I attempted to with my shot quads. Running a tough 100k the day before a wedding is the greatest excuse for being a crappy dancer. Sometime during the evening when we were talking about the race and I was saying how it was the hardest thing I’d ever done and how it had made me so scared of Eastern States that I was questioning even attempting it she fixed everything. I don’t remember her exact words (thanks hard cider), but basically she reminded me that it isn’t supposed to be easy, that ultrarunning is supposed to be hard and is supposed to push you to your limits. And what better way to push yourself to your limits than to attempt a race you fear you will not be able to finish. Look out Eastern States, it’s almost go time! Great read! I am running WE100k in a few weeks and totally nervous. Awesome, thank you! I'll be there again this year!